Mrs. Hall, a delightful woman from Oklahoma and the mother of a dear friend, once explained to me—when I was still quite young—that humankind is well beyond the age of hunters and gatherers, and that "dining should be an experience!" 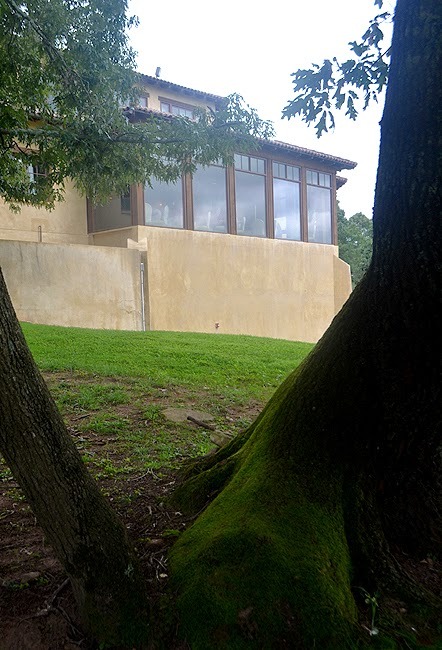 Le Vigne at Montaluce Winery is exactly that...an experience. 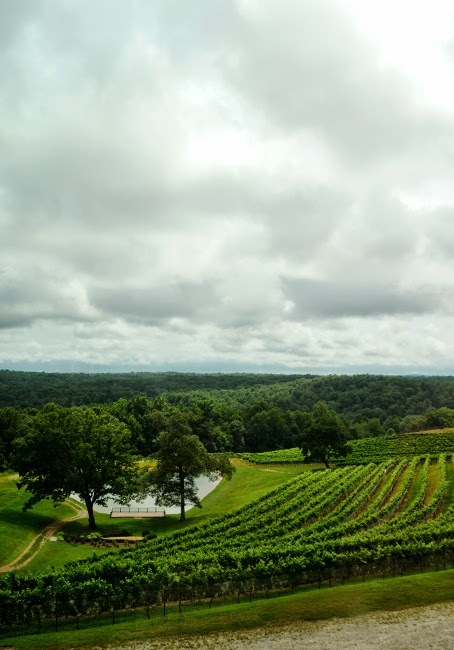 My best friend Barry and I, on a recent visit to Montaluce, enjoyed the pleasure of a behind-the-scenes tour, a wine tasting, and then lunch at Le Vigne with a table visit from Chef Austin Rocconi. 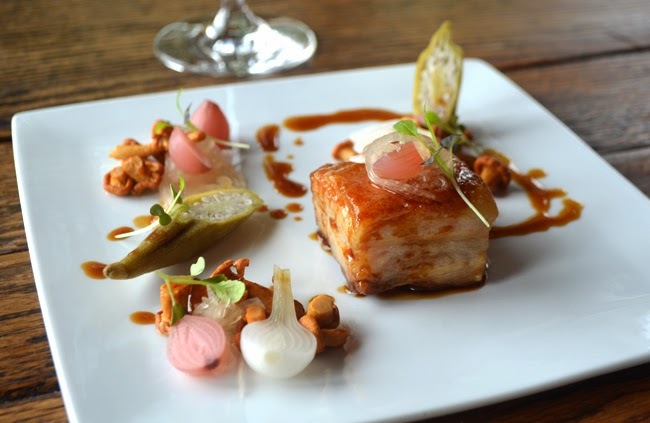 Some of the restaurant's PR surrounding Chef Austin reads, "At Le Vigne, Chef Austin’s personal style is reflected in the artistry of his plates, his well established flavor combinations, and a distinctive way of presenting familiar local ingredients with an innovative elegance." Beautifully said. And, from what I discerned during my dining experience, every bit of it is true. I would add that he's committed to culinary mastery; delivers not just a meal, but an experience; and once you get past the formality of chef-meets-diner, he's quite personable. And I'm grateful that he spent so much time with us talking food and geography. Our learned server, Hannah, was quite charming, bright, and friendly...a complete and total credit to the hospitality industry. However, I call her "learned" not because she looks like the Hollywood stereotype "studious"—she's quite beautiful, not that studious women aren't beautiful, I think they totally are—but because I overheard a regular asking her about school. Turns out our "waitress" has quite a promising career ahead. All the best, Hannah! There was no "perusing" the menu. It was a exercise in control...an exercise in not salivating all over oneself. Barry ordered the Prosciutto Di Parma, with pickled golden raisin and extra virgin olive oil (the best prosciutto I've ever had!) 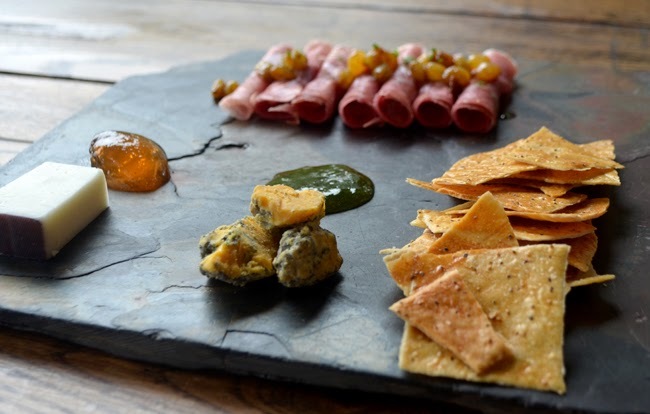 and Chef sent out with that their Drunken Goat Cheese—soaked in red wine!—with a mixed berry compote, and English Shropshire with jalapeno jelly. The Shropshire was AMAZING! 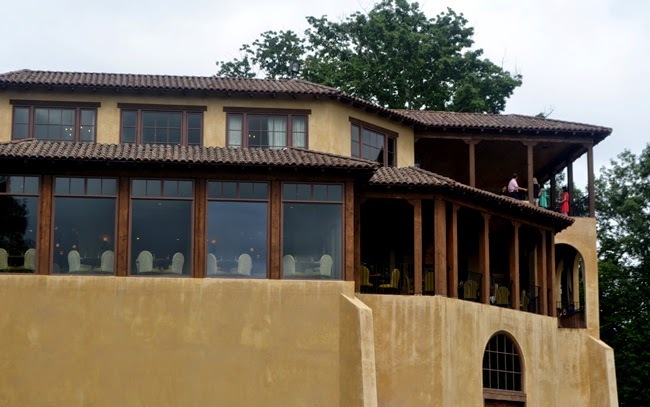 We were seated next to a window overlooking the vineyards. The photo above was made after standing and walking toward the window 2.5 feet from my quite comfortable chair. I felt like such a tourist making photos during lunch, but I really wanted to share the experience with you and I tried to look like a "reporter". That was quite a challenge with such a tremendous smile on my face throughout the meal. The one item on the menu that I knew I had to experience was the 64°C Vidalia Onion Soup. I saw "Vidalia" and didn't even need to read the remainder of the description. Why? Chef Austin has been a challenger in the Golden Onion competition, a pre-festival Vidalia Onion Festival event, and one that I follow every year. 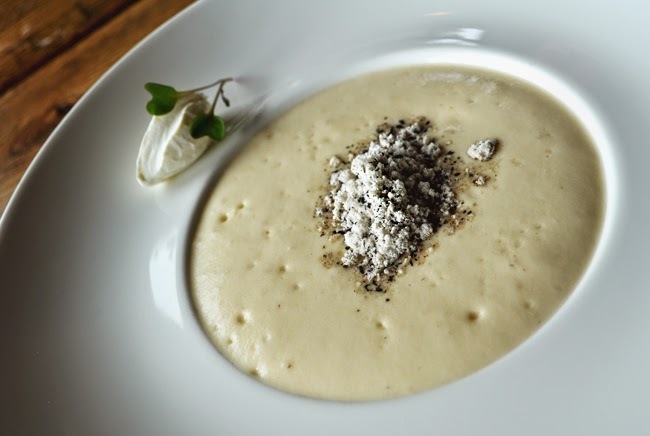 The soup, perfectly flavored—that wonderful Vidalia Onion flavor, but light and delicate on spice—was foamed, though thick enough to still be soup. It was explained that it's served at 64° because that's the optimum temperature for its preparation method. Best of all, it's topped with powdered black trumpet mushroom, which is almost blue-cheesy in flavor, and powdered brown butter—the powdering is a fascinating process! And once the powder hits your tongue, it's reconstituted. There's a dollop of yogurt on the side, with gorgeous micro-greens. I started to enjoy them separately, but Hannah came along and noted that stirring the elements together would enliven the taste experience even more. And it did. Such a brilliant dish! I sincerely hope it's still on the menu when I return. Barry had the Pork Belly with assorted pickled vegetables and a rich reduction. He thoroughly enjoyed it and it was beautifully presented. We also commented on the Compressed Watermelon, Garden Beets, and Rainbow Quinoa. I don't know who's naming and describing these dishes, but they make me want to be a total glutton! Just look at this menu! 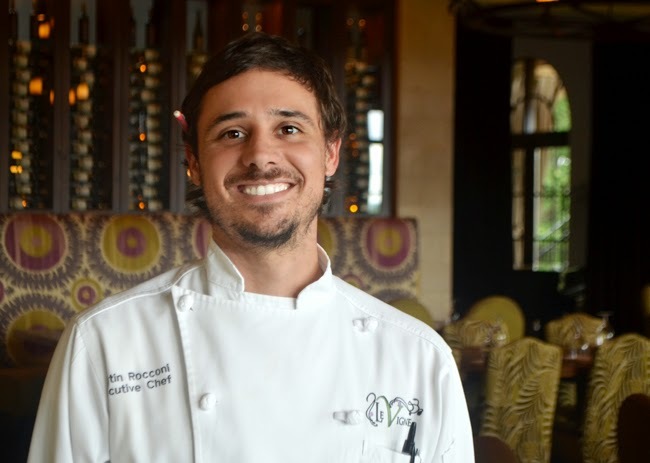 I was excited to learn of Chef Austin's background in Mediterranean cuisine, having lived in Greece for more than two years and having immediately fallen in love with the cuisine. And it turns out that Chef is from Hattiesburg, Mississippi, where Barry lived for a number of years, and where we visited earlier this year. We were there on the way to visit Natchez, Mississippi, a beautiful city with abundant antebellum charm. We also spent a day in New Orleans. That was a fun long weekend! Speaking of Mediterranean cuisine, again I was thrilled to have opted for "Chef's Choice". 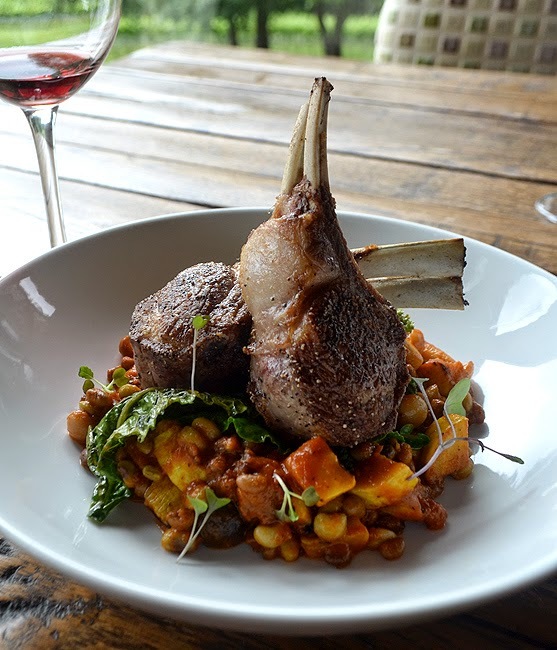 Chef Austin sent out the New Zealand Lamb pictured above. A pastiche of on-premise chef's garden vegetables were seasoned so brilliantly that I was left with absolutely no choice but to devour them...in a polite pace, of course. 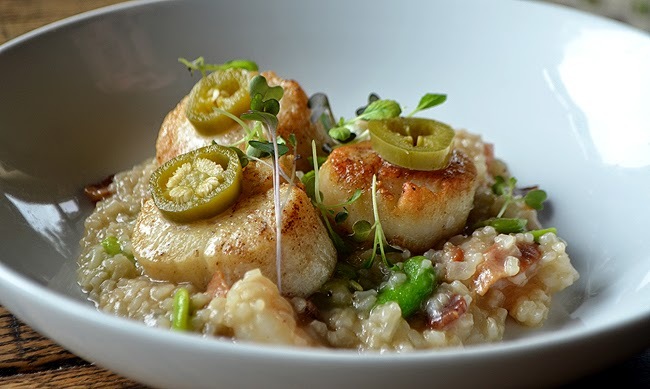 Barry had the East Coast Scallops with sweet corn, pickled jalapeno, and charred octopus atop Anson Mills Carolina rice grits. Yes, I begged for a bite...scallops are a favorite! As amazing as the description sounded and as absolutely delicious as it looked, I just wasn't prepared for how it tasted. It was the best bite of culinary bliss I've had the pleasure of enjoying in ages! More, more! The time got away from us. The afternoon felt like one of those Hollywood time-lapse sequences...ours was filled with clips of learning, fascination, delight, and an all-around wonderful time. So much so that we had to dash out to our next destination—sadly having to miss dessert. But that gives me something to look forward to on the next visit! 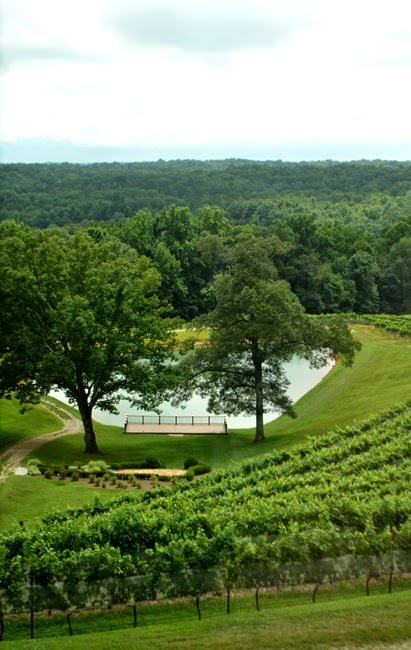 I want to offer a "Thank you to Pineapple PR for connecting wanderlust ATLANTA with Montaluce Winery and Le Vigne. I've thoroughly enjoyed my near-Atlanta excursions over the years, but I have to say, this one was beyond fantastic! I'll be back soon. I didn't want to leave Montaluce, let alone Le Vigne. The only thing that kept me from feeling melancholy about having to depart, was the sweet self-promise to return for one of Chef Austin's desserts. I'll be back!